Caterfly’s Open Smart Adoption process is designed accommodating the best understanding of human behaviour in organisations, and structured to give the best possible chance of lasting success. By success we mean that teams and organisations become more effective, with staff more engaged and happier, and with systems in place for embedding continuous improvement, responsiveness and organisational learning for the long term. It starts when one or more people can imagine improvement, and become curious about better ways of working. The Open Smart Adoption method sets out a strategic approach, with distinct yet iterative phases of learning, resolving, applying and evaluating involving the whole team or organisation. ‘Imaginal cells‘ begin to appear which are not related to the functioning of the caterpillar. They begin to form weak clusters with other imaginal cells while the caterpillar, having built its reserves, enters into a new stage of its life. Building a safe container for its transition, the imaginal clusters can now connect and strengthen while the caterpillar’s body becomes the material from which these clusters will create the new organism. 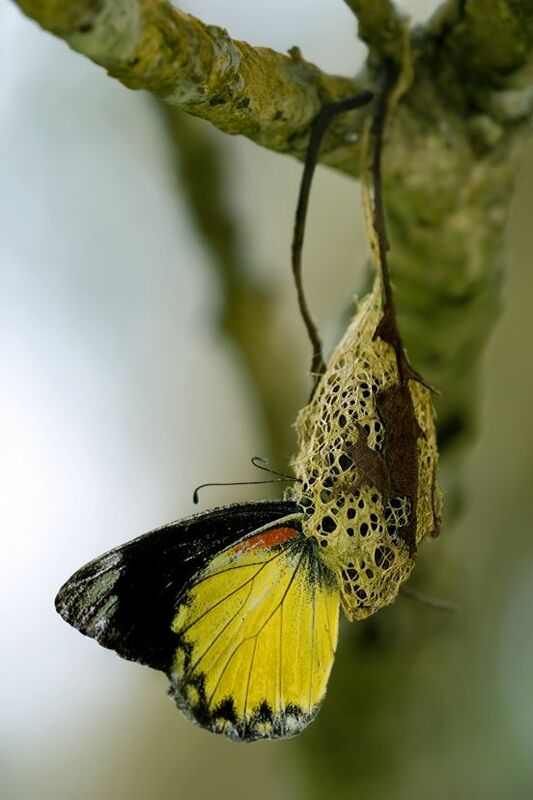 When it is ready, the cocoon opens, and the transformed butterfly emerges, revealing its mature, imaginal state, with new needs, behaviours and beauty. Phase 1 of Caterfly’s process includes designing a phased implementation strategy with and appropriate to the needs of the client. All staff are then invited to support each other in setting their own agenda for growing and improving their way of working, with the mentoring of specialists. During this ‘cocoon stage’, trying out simple tweaks is emphasised. While commitment never wavers from getting the job done, a culture of innovation is encouraged. In this culture, ‘failures’ become successful experiments from which valuable learning is built. After a period of applying new ideas and learning, the team or organisation is invited to come back together to evaluate, support each other, and set its strategy for embedding useful adjustments for the long term. Support from specialists can be designed in, but the emphasis is on building capacity so that empowered staff can lead. At this stage of the process, a new, smarter organisation emerges. The specialists retreat for a short time, to make sure that self-organisation isn’t hampered. The butterfly needs to try its wings.